geek with curves: Pink Raygun Post: Who Doesn't Need a Lightsaber Wall Sconce? Pink Raygun Post: Who Doesn't Need a Lightsaber Wall Sconce? I am continually amazed by the number of geek themed things available for purchase. It seems to me that the choices for home decor have increased a lot over the past ten years. 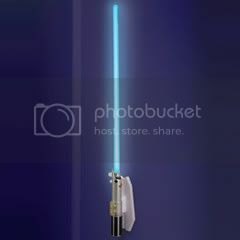 I list a few of my favorites in my latest post at Pink Raygun, Who Doesn't Need a Lightsaber Wall Sconce?. Can you turn the humming sound of the lightsaber wall sconce off? I love the idea of having many different color options, but I think the noise would get on my nerves after a while. I recently acquired a few lightsaber chopsticks (Yoda, Darth Vader, Luke-blue). I should seek out more Star Wars stuff for my kitchen! I think I could have one of those in every room in my house! i need this in my kitchen for improptu fights with the locals , i.e. the random cockroach. Eleni - Ooh, you make a good point! The constant noise would get to me too. I only have one set of the chopsticks, and I definitely need more. :D Williams Sonoma has lots of great Star Wars stuff right now. AradiaDiane - I could definitely see this; they would all have to be set to different colors of course. Will the Force Make Me a Better Cook? Make Your Own Geeky Gifts! My Holiday Geek Gift Suggestions!